Digital divides have been long thought of in terms of access and skills. These are still important, but the essays in this volume challenge and go beyond this way of thinking. They examine not just many overlooked examples of divides but also bring to bear fresh theoretical perspectives. This book will open up exciting new directions for the next generation of internet researchers. 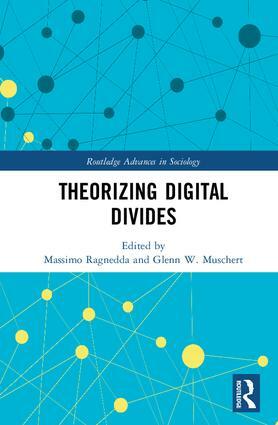 This is a welcome volume that develops our understanding of digital divides. It does so through a highly informed understanding of current theoretical knowledge of digital divides in a range of disciplinary perspectives. The authors combine to extend this knowledge in meaningful ways to address the nuances and complexities of digital divides. The theoretical developments will be extremely beneficial for scholars and students working in the area of digital divides. This book provides a much-needed wide-ranging theoretical foundation for research on the digital divide. While scholars and activists have done yeoman’s work identifying, studying and narrowing digital divides, Ragnedda and Muschert have put together the theoretical infrastructure with which we may understand past efforts and move forward with new ones. The book is most valuable for the sociologist searching for ways to approach digital phenomena (students and early career researchers) rather than policymakers, opinion formers or our engineer wishing for guidance. All the chapters agree that our understanding has moved on during the century, that the simple question of access has been trumped by a second level of inequality of skills and education, and even a third level of unequal abilities to gain social goods from online activity. The breadth of Theorizing Digital Divides coverage is a virtue. Chapter 3: Tomohisa Hirata, Do contemporary media technologies and the architects of them fill the role of the psychoanalyst for the users of them? Chapter 5: Gerard Goggin. ‘Disability and Digital Inequalities: Rethinking Digital Divides with Disability Theory’. Section 3: Critical and alternative perspectives. Chapter 12: Citt Williams, Tania Gupta, Marilyn Wallace, Theorising Online Representation and the Voice of the Digital Subaltern. Chapter 14: Emma A. Jane, Gendered cyberhate: a new digital divide? Massimo Ragnedda is a Senior Lecturer in Mass Communication at Northumbria University, Newcastle. Glenn W. Muschert is a Professor of Sociology and Social Justice Studies at Miami University, Ohio, USA.